I’m literally just getting my feet back under me after returning from my 4th visit to Argentina. Whether it’s our growing familiarity with this culturally rich country, our growing friendships, the fish, the food or the diverse fly-fishing opportunities that seem to abound in this vast country, these trips just seem to get better. 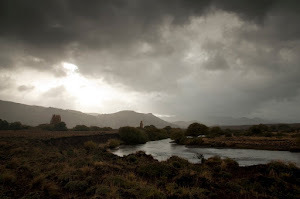 Ron Sorenson, our host while fishing in Argentina, told us after last years incredible pleasant due to the countries very cooperative weather we should scale back this years expectation some. As he said, for Argentina or anywhere for that matter, “it doesn’t get much better than what you had last year”. On an entirely different level this trip was as impressive as the last, or any that we have taken for that matter. 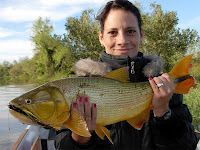 After traveling here for several years that is what I’m finding quite refreshing about fly-fishing in Argentina; it has so much to offer it always surprises you sending you home with an aspect of the experience you didn’t expect. One little surprise brings a note of interest to Argentine travelers who frequent this country or for those who are planning a trip in the near future! Unexpectedly we were informed upon arriving in the country that they no longer allow you to take your rods and reels on the plane when flying domestically within Argentina. 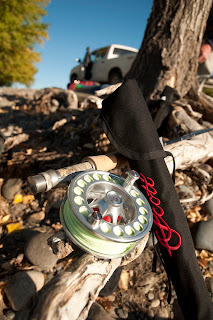 When I travel, I don’t like being disconnected from my rods, reels or flies. These are my babies. Whenever possible, they are always close at hand, yet that is getting harder to do these days. Fortunately for me, one of my customers had a Fishpond Dakota Carry On, and I was able to stuff my rods in that with those he already had in tow. All said and done we had 11 rods, not to mention a hand full of reels in this bag. After putting a price tag on the contents of that bag, a value that exceeded the price of this trip, we got a little concerned about the possibility of loosing its contents. On good advice from Gaia Macchiavello, our guide while getting around in Buenos Aires, we had the bag wrapped in plastic before checking in. Thanks to EBay, the worlds largest Pawn Shop, there is an easy and very lucrative way to turn your fly-fishing equipment into quick cash. Last thing you want to do is make it easy for potential thieves to gain access to your valuables. Should they, at least bury and hide your reels, flies and secure your valuable rods. Lock them when you can or wrap them in plastic if possible as we did in Argentina. This type of theft doesn’t happen very often, but you still want to error on the side of caution. For $10.00 we wrapped up the bag and sent it off; well worth creating the hassle given the value of your gear. It was an incredible trip. I’m still putting the finishing touches on my journal, and each day I conclude brings back moments of a trip that lived up to everyone’s expectations. Can’t wait to go through all my photo’s and publish some of them here as well. If you haven’t been to this country and you have the opportunities to travel with your fly rod, Argentina should be on your buck list. Although at the time it wasn’t at the top of my list, it is now, Chow!